Richtgerät für Funkpeiler, Fu. 30a. 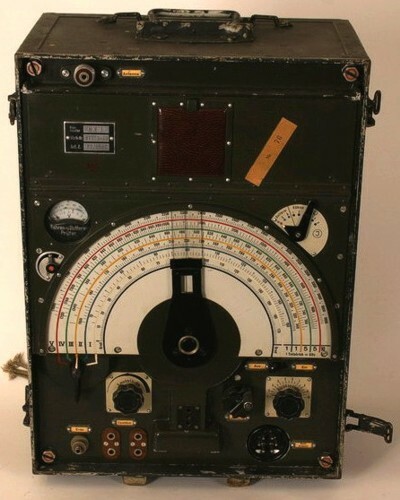 The radio direction finder (HE-1) was used to locate enemy radio positions. The antenne was direction sensitive but its exact location had to be known so it could oulined in the proper way. The optical Fu. 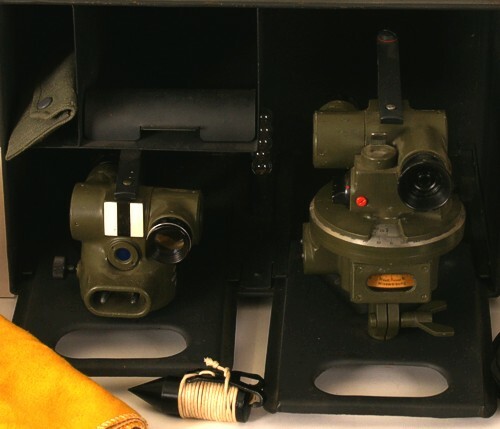 30a set has two small surveyor instruments. A simple reticle is included. One instrument was placed nearby the radio receiver. The second one was placed further away and has a built in compass. With a cross bearing, for instance using a churchtower, the exact location of the antenna could be calculated. A needle in the instrument close to the receiver would be influenced by the magnetic field of the powersupply, so the set has only one compass.